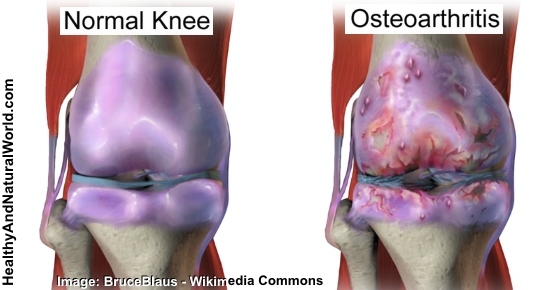 Osteoarthritis (OA) is a form of degenerative joint disease which causes a variety of symptoms such as pain, swelling, abnormal bone growth, disfigured cartilage and loss of motion. While sufferers can contract OA in any joint, it is most commonly noticed in the knee, back and neck, hips, fingers and toes. In this article you’ll find natural remedies that can help relieve joint pain and treat knee osteoarthritis: cabbage leaves, gelatin, turmeric extract (curcumin) and sesame seeds. They are all research based and are safer alternatives than conventional medicines. Simply wrapping your leg with cabbage leaves was shown to reduce joint pain and help relieve symptoms of knee osteoarthritis. Cabbage is a cruciferous vegetable that belongs to the Brassica family. Cabbages have long been used for their inexpensive and therapeutic healing properties. They are high in beta-carotene, insoluble fiber, vitamins B1, B6, C, E, and K, and the minerals iodine, magnesium, iron, calcium and sulphur. Cabbage has antioxidants such as sulforaphane and kaempferol that are responsible for its anti-inflammatory properties. An animal study from 2013 published in the journal Arthritis and Rheumatism found that sulforaphane blocks the enzymes that cause joint destruction. The Clinical Journal of Pain published in 2016 a study aiming to test the efficacy of cabbage leaf wraps in the treatment of knee OA (stage 2 and 3). The first group was treated with cabbage leaf wraps daily for at least 2 hours. The third group continued their usual treatment (including pain medication). After 4 weeks of treatment the patients treated with cabbage leaf wraps reported significantly less pain, improvement in functional disability and quality of life compared with those who continued their usual treatment, but not when compared with the topical pain gel group. The researchers concluded that cabbage leaf wraps could be used to complement conventional therapy or even as an alternative to drugs. Therefore, cabbage leaf wraps might be recommended to patients with OA of the knee and you can also try using it to relieve other forms of joint pain. Here are the simple steps for making your own cabbage leaf wrap to relieve knee osteoarthritis and joint pain. Please note that if you have a rare case of allergic reactions to cabbage such as swelling and itching sensation after application, you should avoid this method. Take 1 to 2 raw cabbage leaves, wash and dry them and place them on a cutting board. Cut out the hard stem in the middle, and bruise the leaves using rolling pin to release the juice within them. Layer the cabbage leaves around the painful joint, fix with a bandage, and apply for at least 2 hours per day. The study also suggested to leave the wraps on overnight for extra boost. Remove the cabbage leaves and clean the knee with warm water. Did you know that cabbage juice has amazing health benefits? It can help treat peptic ulcer, prevent cancer, lower bad cholesterol and more. Gelatin is a clear flavorless food ingredient which is used in a number of food products. It is derived from collagen (which is a key component of healthy joints) and is extracted from the bones, hooves, skins and tissues of domesticated animals sent for slaughter. It is an effective gelling agent and is therefore most often found in gummy candy, marshmallows, some yogurts and jellied deserts. Gelatin is also used to make the coatings for capsule pills, some cosmetics and some paper. Food grade gelatin is usually sold as either a clear sheet or as granules, it dissolves easily in hot water but turns into a gel as it cools. A study that was reported at a meeting of the American Academy of Family Physicians in Dallas suggests that adding a special gelatin supplement to the diet could provide some relief to people with mild osteoarthritis of the knee. In the study, 175 patients with osteoarthritis of the knee were randomly assigned to receive either a daily gelatin supplement or a placebo. Those who received a supplement containing 10 grams of gelatin plus calcium and vitamin C had significant improvements across the board in pain, stiffness, and mobility measures. While the results of this study are encouraging, the improvements may not be solely attributable to the gelatin used in the study. Because the treatments used in the trial contained vitamin C which is a very powerful and effective antioxidant, there is some thought that the protective effect was due to the presence of vitamin C and not gelatin. Studies of dietary habits have shown that people who have a diet rich in vitamin C are less likely to develop OA than those whose diets are a poor source of the vitamin. Just 60mg of vitamin C – equivalent to that found in a single orange is thought to have a protective effect. The bottom line: If you wish to supplement your diet with gelatin in order to treat OA, you should also consider upping the levels of vitamin C you consume – good sources include citrus fruits and berries (which also have other health benefits). If you do decide to supplement your diet with gelatin there are several ways that you can do so. Gelatin is readily available from health food shops in pill form which suits people who do not wish to go to the trouble of preparing gelatin. They simply take the supplements as directed. Some people prefer not to take supplements. If you prefer to get your benefits directly from your diet instead of from a pill, it is possible to take gelatin as a food. Any form of gelatin that is available in food shops will confer protective benefits; you can even eat Jello (sugar free of course)! Just follow the instructions on the packet. If you are a meat eater you can also boost the levels of natural gelatin in your diet by including more hearty bone broths in your meal plans. For some people, traditional gelatin, even as a supplement, is not an option because it comes from animals. Even some meat eaters might have to avoid it for religious reasons if they are not sure of the exact animal origin of the product. Vegetarian gelatin substitutes are available for cooks but they have not been subjected to any trials and therefore it is not known, at this point in time, whether they are able to confer the same benefits as traditional or fish gelatin. For people who are unable to consume meat based gelatin but wish to benefit from its healthy properties, it is possible to purchase gelatin made from fish. Ibuprofen is a widely used non-steroidal anti-inflammatory (NSAID) painkiller, often taken by people who experience pain in their knees (and specifically for knee osteoarthritis). While it usually helps with the pain, it also comes with several side effects. In severe (and rare) cases, it can cause kidney failure, bleeding from the stomach, heart attack and stroke. More and more empirical research is now showing that turmeric extract is effective as Ibuprofen in treating knee pain, and it’s much safer too. Turmeric, ‘the king of all spices’, has many potential health benefits and is often used in alternative treatments. It not only relieves pain, but also boosts immunity, helps with digestion and heart health, and reduces bad cholesterol levels. In addition you can use it as a natural medicine for many different health conditions. When consuming this ancient spice, you are indeed doing your body an all-round favor. However, one drawback of turmeric is that it has low absorption and rapid metabolism that lead to relatively low bioavailability in the body. But the great news is that you can greatly improve turmeric’s bioavailability in your body to super boost its miraculous health benefits by following my advice in my previous article. Turmeric has been used in India for thousands of years and it’s well known as a spice that gives curry its distinct yellow color. It contains compounds with medicinal properties – the most important of these compounds is curcumin. The curcumin content in turmeric is not that high, approximately 2%. So a tablespoon of turmeric, which weighs about 6.8 grams, contains about 0.136 gram curcumin. That is why turmeric extract needs to be used when looking to achieve health benefits and when studying this ancient super spice. In 2009, a study published in the The Journal of Alternative and Complementary Medicine, looked at the efficacy and safety of curcuma (Curcuma domestica) extract (curcumin) in patients with knee osteoarthritis (OA). Ibuprofen (800 mg per day) or turmeric extract (2 g per day). Both groups improved after the treatment period, and the turmeric group exhibited less pain when walking up the stairs. The researchers concluded that curcuma extract was ‘similarly efficacious and safe as ibuprofen for the treatment of knee OA’. Another study, published in 2014, provided even more evidence for the use of turmeric. This bigger study (with 367 participants) was also conducted in Thailand and looked at the pain reduction and functional improvement of patients with knee osteoarthritis after taking curcumin (the active ingredient in turmeric). Again, turmeric extract (curcumin) proved to be just as effective as ibuprofen in treating the pain. Moreover, less side effects were reported in the turmeric group. The number of events of stomach pain and discomfort was significantly higher in the ibuprofen group compared to the curcumin extract group. Turmeric, on the other hand, is safe for most people. Side effects of turmeric occur very rarely and involve relatively harmless cases of stomach upset, diarrhea and dizziness. People with gallbladder disease, gastrointestinal reflux or those who are expected to have a surgery within two weeks, should not use curcumin extract. In addition, it’s always a good idea to consult with your doctor before taking it. Whereas turmeric extract was compared to Ibuprofen as previously mentioned, this time scientists compared another plant to a commonly prescribed painkiller. This time, sesame seeds were studied alongside Tylenol. Tylenol is a common over-the-counter pain killer. Another trade name for it is Panadol. The non-proprietary name used in the US is acetaminophen, while the name paracetamol is used elsewhere in the world. It is classified as a mild analgesic, but, in some case, even small doses can cause death. Other adverse effects have been recorded, ranging from liver damage to asthma. Although the side effects usually occur when the recommended dose is exceeded, it is important to note the drug’s potential toxicity. Sesame is believed to be one of the planet’s oldest cultivated plants. It was mentioned by the Ancient Egyptians as a powerful medicinal plant and has been used for over 5,000 years to produce flavorful and nutritious oils. They come in a host of different colors, depending upon the variety, including white, yellow, black and red. A research group from Tabriz University in Iran decided to study sesame’s (Sesamum indicum L.) effect on the symptoms of knee osteoarthritis, which include pain, swelling, loss of motion and changes in joint shape. Fifty patients were included in the study and divided into two groups. The control group received standard therapy, which involved 500 milligrams of Tylenol twice daily along with 500 milligrams of glucosamine once a day (Glucosamine is one of the natural remedies for arthritis). Twenty-five patients in the sesame group received 40 grams of sesame seeds daily along with standard drug therapy. The study lasted for two months and the two groups were then compared in their pain sensitivity. The patients receiving sesame had significantly less pain compared to their counterparts in the control group. A questionnaire and the Timed Up and Go test (a simple test used to assess a person’s mobility and requires both static and dynamic balance) were also used for assessment, but the two groups didn’t differ significantly on those measurements. The results were published in The International Journal of Rheumatic Diseases, in October 2013. Although this was a small study, the authors suggested that sesame seeds might be a viable adjunctive therapy for knee OA. I want to highlight the fact that according to the study sesame seeds can greatly enhance the benefits of using prescription medications but the study didn’t test a complete replacement of OA medications with sesame seeds. The results are still encouraging as you can greatly enhance the benefits of prescription medications by consuming sesame seeds. How Much is 40 Grams of Sesame Seeds? One tablespoon of sesame seeds is about 9 grams, so approximately 4 tablespoons per day is roughly the dose used in the study. The researchers used ground sesame seeds to aid absorption. For best therapeutic benefits, you should buy sesame seeds that are raw and organic. Ground your fresh sesame with a mortar and pestle or a coffee grinder and then enjoy the multiple positive effects that include benefits to your heart and circulation, cancer prevention and mood improvement.